Two wins for the two promotion contenders - one slightly more dramatic than the other. 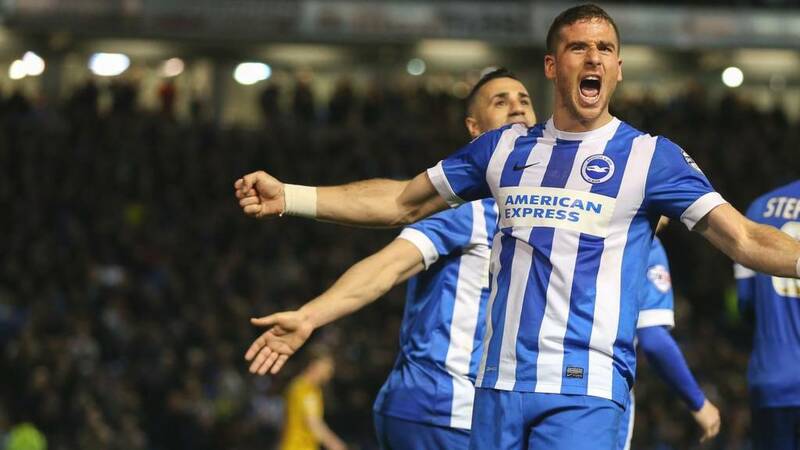 Brighton cruised to a 5-0 victory over Fulham, while Hull needed a stoppage-time winner to defeat Wolves 2-1. Thanks for your company this evening, and be sure to join BBC Sport for more live football on Saturday. That's how the top of the Championship table looks going into tomorrow's games. Burnley will go back above Brighton if they beat Birmingham City. Hull remain fourth and are eight points behind the Seagulls, while they're 10 above seventh-placed Cardiff. So Brighton go back up to second, one point behind leaders Middlesbrough. Can the Teesiders strengthen their promotion push when they face already-relegated Bolton tomorrow? Join us for live text commentary from 12:15 BST. Quote Message: It's been an awful display of football, but that Snodgrass goal might just change the complexion of the season. Hull City are looking worse and worse to me, but these three points might just give them the confidence boost they need. They didn't deserve it, but we'll take it! It's been an awful display of football, but that Snodgrass goal might just change the complexion of the season. Hull City are looking worse and worse to me, but these three points might just give them the confidence boost they need. They didn't deserve it, but we'll take it! Brighton are back up into the automatic promotion places in some style. The visitors had the better of the opening exchanges but fell behind when Tomer Hemed scored from the spot after 29 minutes. The Israeli headed home his second before the break and completed his hat-trick to make it 4-0 after defender Bruno had scored his first of the season. Anthony Knockaert completed the scoring for the hosts late on. And that's the last action. Hull go 10 points clear of seventh-placed Cardiff. Are they out of the automatic promotion race? Despite an average performance, they're not quite done yet. Late drama at Hull! It's a magical free-kick from substitute Robert Snodgrass. The winger curls in a beauty, in off the crossbar, to give Hull victory. Into three minutes of injury time at Hull, where it's gone very, very quiet. A 1-1 draw looks nailed on. Anthony Knockaert adds the cherry to the icing on Brighton's cake. The Frenchman fires beyond Marcus Bettinelli in the Fulham net. Fulham's run of three successive victories is coming to an end in dramatic fashion. Hull substitute Sone Aluko sends a low shot from 20 yards straight at Wolves goalkeeper Carl Ikeme, who gets down quickly to make a smart save. Time running out for the Tigers. Quote Message: It's time City scored a goal now - it'd give them some confidence and really lift the game. It's time City scored a goal now - it'd give them some confidence and really lift the game. Only six minutes and stoppage-time for Hull to find that winning goal if they are to move 10 points clear of seventh-placed Cardiff. Tomer Hemed scores his first hat-trick in English football with a tap in from Dale Stephens' low cross. The Israeli is immediately subbed off. His work for the evening is done and his side have more than done enough to win this match. Brighton's goalkeeper has been one of the key players in their promotion bid this season, so much so that he could be a possible contender to go to Euro 2016 with England. David Stockdale, who has been in Three Lions squads before without winning a cap, says he'd rather go up with Brighton, telling BBC Sussex: "It is always nice but I would take promotion this season over an England call-up any day." The former Fulham man has been forced into a couple of saves in the last few minutes as he looks to reach 16 clean sheets for the season. Bjorn Sigurdarson's long wait for a Wolves goal continues, but only because of a fine save by Allan McGregor to keep out his shot from 20 yards. You have to go back to August 2013 to find the last time that the Iceland striker found the net for Wanderers. Hull striker Abel Hernandez forces Wolves goalkeeper Carl Ikeme into a smart save down to his left. That might be Ikeme's first action since the mistake that gifted Hull the opening goal after five minutes. He might be looking pensive in the above picture but you can bet Chris Hughton is delighted with how his Brighton side have got through this game tonight. They had to weather the storm early on but kept Fulham at bay and have not looked back since striker Tomer Hemed put them ahead from the penalty spot after 29 minutes. Hull have made a change, with Robert Snodgrass coming on for right-back Moses Odubajo - pictured above attempting to put a cross into the Wolves box. At present, Hull look a little short on ideas in their search for a winning goal. Steve Evans is always a good shout for giving us a smile on a Friday evening... and even though this picture was taken at the end of last season, it's well worth revisiting. An excellent shout from Matt, too - congratulations to all at Northampton on their promotion from League Two. Quote Message: It's all looking a bit flat. The players need to take some responsibility for the way they're performing. They'll know that the way they're playing isn't good enough, there just doesn't look to be any understanding between them or any pattern of play. It's all looking a bit flat. The players need to take some responsibility for the way they're performing. They'll know that the way they're playing isn't good enough, there just doesn't look to be any understanding between them or any pattern of play. Heading into the final 30 minutes at Brighton, who are going second in the Championship as things stand. Tomer Hemed's first-half double got them on their way and the Israel striker now has 15 goals this season. If he can keep up that form in the remaining four games, then the Seagulls could well be starting the next campaign in the Premier League.